Are We Sometimes Better Off WITH or WITHOUT Makeup? Let’s be honest, there are some of us that are blessed with natural beauty and some of us that need a little makeup help to enhance our beauty or hide certain unwanted blemishes. I, sometimes can look quite pale (as you can see on the picture shown below) and like to add colorrrr (i.e. bronze and/or blush). There are also my big, round eyes which I enjoy accentuating with my number one look — winged/cat eyeliner. Here is a picture of myself au natural with freshly done eyebrows (first time I threaded them) and the other one with of course makeup, what do you think? Now, check out the celebrities I provided my kiss of opinion. Enjoy! I really love this Indian Beauty Queen turned actor! She’s absolutely beautiful! She has the natural beauty going on, and, yup, looks even better with makeup. The makeup helps to enhance her piercing grayish-blue eyes. Our fun-to-watch Jersey Shore character! 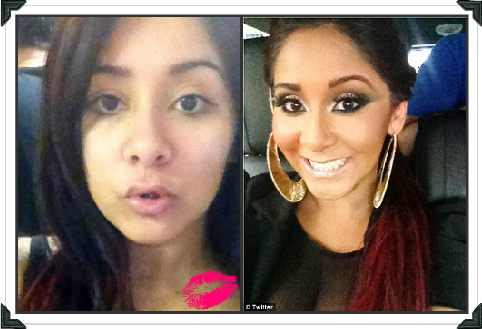 I really like how Snooki looks without makeup…natural definitely suits her! If I were her Makeup Artist I would accentuate her eyes with a more natural makeup look with taupe, brown, purple shadows. Hmm, I was a bit indecisive with Kat. 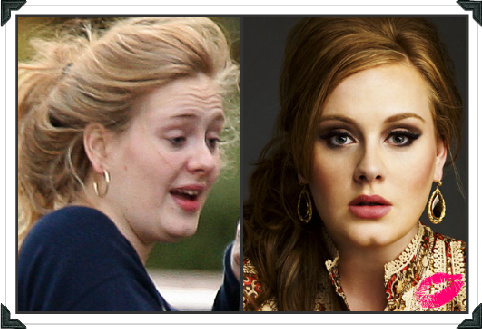 She doesn’t look horrible without makeup, I think it was a bad shot taken by the photographer (we all have those). I like her extreme smokey eye look tagged with bold red lips which she owned for years. Adele’s New Zealand born, Makeup Artist, Michael Ashton has released a craze of makeup tutorials trying to imitate Adele’s retro glamour makeup look (including myself!). She always looks absolutely stunning with her signature cat/winged eyeliner makeup. 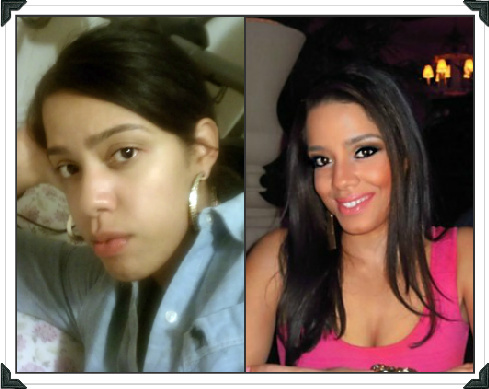 Honestly, I cannot believe that’s how Kerry’s face (left) looks like without makeup! That’s why I placed my vote/opinion in the middle. However, comparing both photos, Kerry looks better with makeup. B E A U T Y runs skin deep; and is in the eye of the beholder.